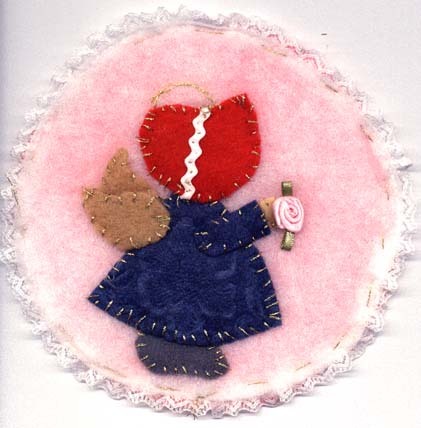 The Sunbonnet Sue Angel sample is made on a round felt back but she is made to applique any where you like. She would look cute on the front of a childs' outfit or on a pocket, etc. The pattern pieces given are templates. If you are using a non ravel fabric or an iron in fusible web you can use this as a cut line. Otherwise, an eighth inch seam allowance should be added on each piece. 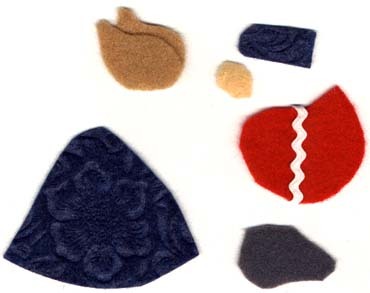 Trace and cut out each pattern piece from colors of your choice. Cut a 5-1/2" circle of your background fabric. Place the boot on first with the skirt slightly overlapping the top of the boot. Place the trim on the hat following the placement in the picture then place the hat slightly overlapping the top of the dress. Using the picture as a guide position the wings and the sleeve tucking the hand under the end of the sleeve. When you have her positioned the way you like iron in place. You may blanket stitch or single straight stitch around each piece making a small gold half circle at the top of the hat for a halo. Stitch the ribbon rose to her hands. Option: You can use fabric paint and a writer tip to go around all the edges and to make the halo. Add your pre-gathered lace around the outside edge of your 5-1/2" circle. You can add hanging loop at the top if you wish. If you are placing the Sunbonnet Sue Angel on wearables there is no need for the background circle. Arrange her directly on the item.